Waterdrop has become a well-known professional water filtration brand. But we still continue to think in customer's place: in what way and for what do you need optimized water? Which products best meet your needs? We have always oriented ourselves to the distinctive characteristics of different customers. We find out that in some countries, tap water is often highly chlorinated and has more contaminants, which is undrinkable, even not safe enough to wash vegetables or to shower. 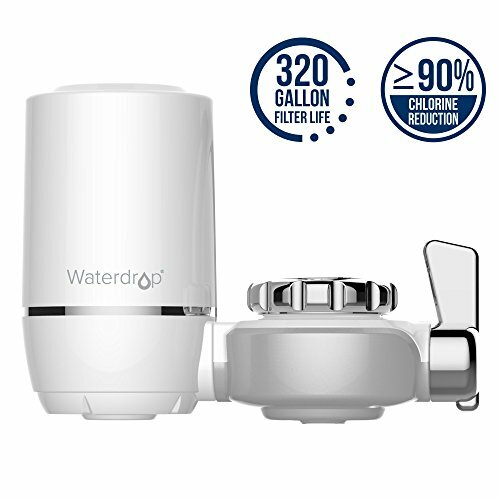 To best satisfy different needs, we launch versatile household filtration products for everywhere you use water in your home, including Pitcher Water Filtration System, Faucet Water Filtration System, etc.. You can now instantly access clean water straight from your tap or your pitcher without consuming expensive plastic bottled water. Moreover, we believe drinking clean water is the basic human rights, so we are committed to delivering clean water to everyone. Together with The Water Project, we invest in better sanitation in schools in Africa to offer children a better future. Every time you buy one filter, one child will get one day supply of clean water. Till now, thousands of students and families are benefiting from this project, enjoying clean and safe water. Every faucet filtration system comes with 100%satisfaction guarantee. We value your feedback, so if you have any issue, please feel free to let us know. We will take care of you right now! 320 GALLONS' LONG-LASTING FILTER LIFE: Each faucet filter delivers 6 months or 320 gallons of clean and fresh water, 3 times longer than most faucet water filters. FAST & EFFECTIVE FILTRATION: 0.5 GPM Hi-Flow design allows you to fill up 4 water bottles (16.9 oz for each) in 1 minute with great filtration performance. The Activated Carbon Fiber (ACF) ensures efficient bacterial inhibition and contaminants reduction, creating refreshing water. ERGONOMIC DESIGN: The faucet features space-saving design. You can equip the tap water purifier for kitchen and bathroom, making it easy for facial cleansing and cooking. CONVENIENT SWITCH: Simple switch lever allows quick switch from quality filtered water to regular tap water. HASSLE-FREE INSTALLATION: The filtered water faucet adopts leak-proof technology and can be attached to your faucet very easily. **This faucet filtration system fits standard faucets. Does not fit pull-out, hand-held or spray style faucets. Please verify if our product suits your faucet before purchase.